The experiences practiced in multisensory learning allow each student to participate in ways that help them understand and retain best. Boys and girls learn together and help each other with projects such as making a braided rug or a log cabin craft, having discussions about the story, historical information, as well as positive character traits such as independence, friendship, etc. Field trips include visiting a symphone or a cave and doing a nature study. 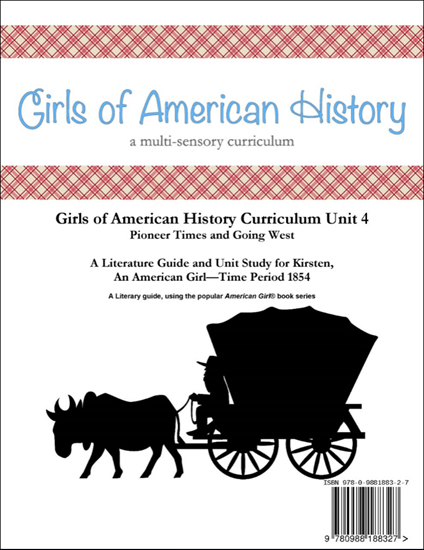 This six week unit study using the American Girl® Kirsten® series books is also great for a large class setting, or a smaller co-op environment. Enjoy a Pioneer Party of your own at the end of the unit! The American Girl Kirsten series is available in a six book reader set. These books can generally be found in most used book stores or online on ebay or Amazon. This series of books follows a young girl's journey from Sweeden to America. See life through her eyes as she has amazing adventures, tragic losses and learns so much about herself. Strong male characters include her brother and father. This unit works well for studying early pioneer times, the Oregon Trail, the Gold Rush, and so much more. The early 19th century really covers so much more than the early pioneer times - stretch this time period out to include Josefina and the southwestern states. Many inventions took place as well as the Lewis and Clark expedition and the Louisiana Purchase. This unit was a favorite with my boys. Craft and field trip ideas from the time period are included in the unit to help enhance the study. Some examples of crafts include; sewing projects, wood projects, drawings and more. Deepen your study with the science of bees and honey. **Crafts are not included in the purchase of the curriculum, but resources and instruction as to what crafts to purchase are included. Some units do include free craft templates. Teacher License allows permission for the purchaser to teach to as many groups and classes as they like. There is no expiration. Teacher may not make copies for parents, other teachers or the school/co-op. The file remains the property of the purchaser only.